CONGRATULATIONS to Mrs. Deana Rollins from O.P. Earle Elementary for being selected as the Spartanburg School District One Distinguished Literacy Teacher of the Year! 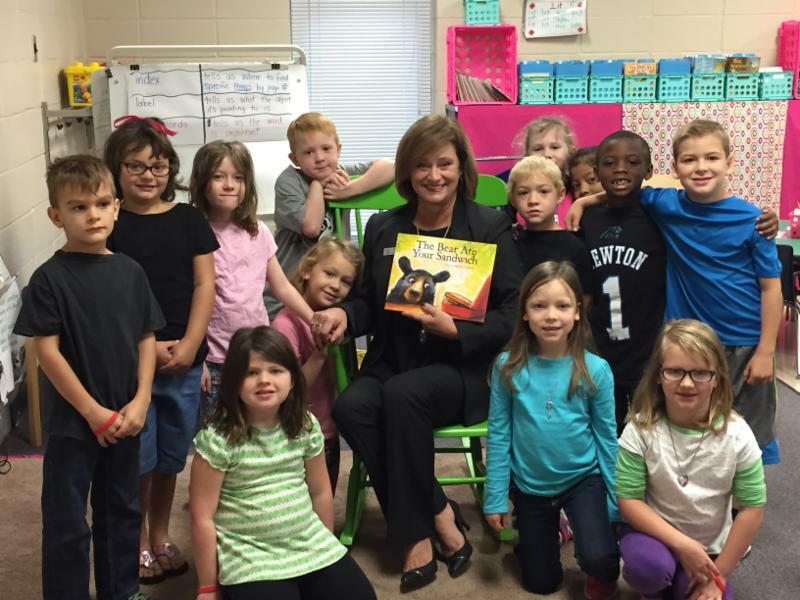 She will represent the district in the upcoming Spartanburg Distinguished Literacy Teacher finals. 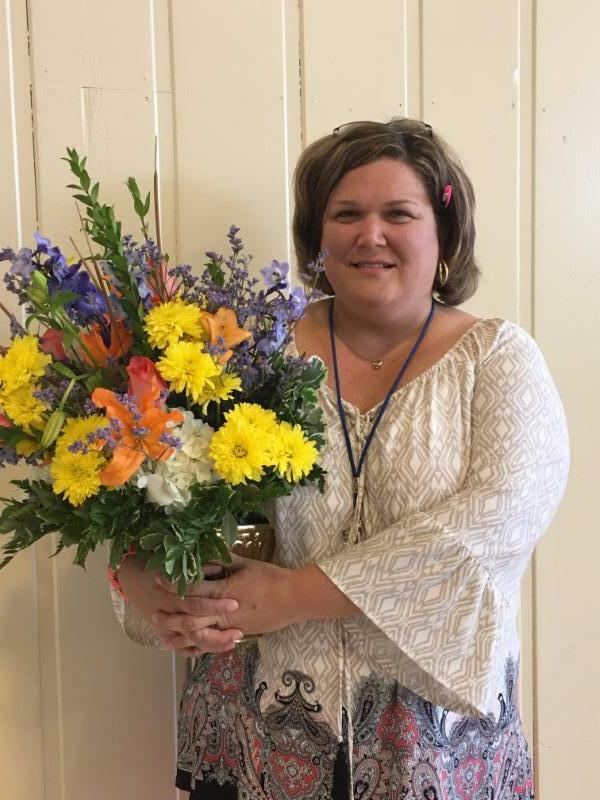 Mrs. Rollins was selected out of six elementary teachers across the district who were nominated by their colleagues for motivating students to read, developing reading skills, and inspiring a love and appreciation of reading in their students. 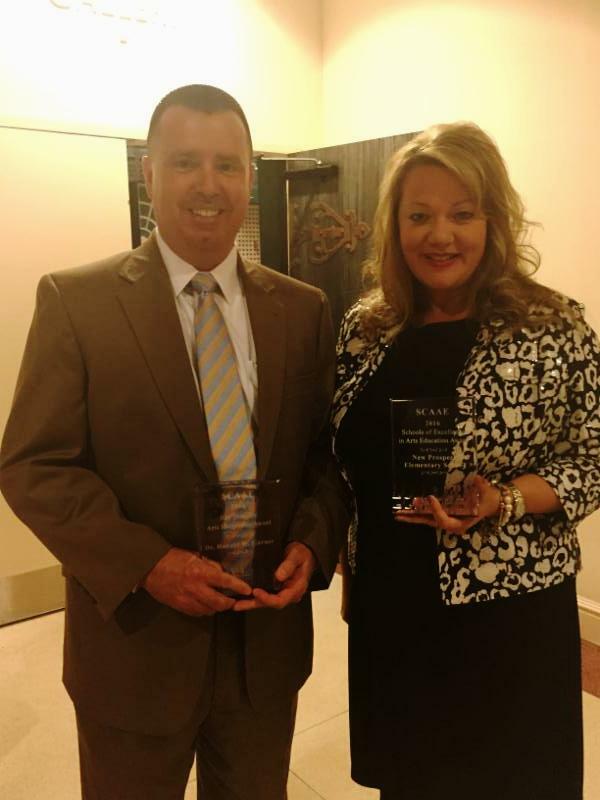 New Prospect Elementary and Dr. Ron Garner both received prestigious awards from the South Carolina Alliance for Arts Education (SCAAE) for their outstanding job of making the arts essential to the education of students. NPE received the “Schools of Excellence In Arts Integration” Award after completing a rigorous application process that included submitting a video of students’ work, footage of teaching and learning, and student performances. 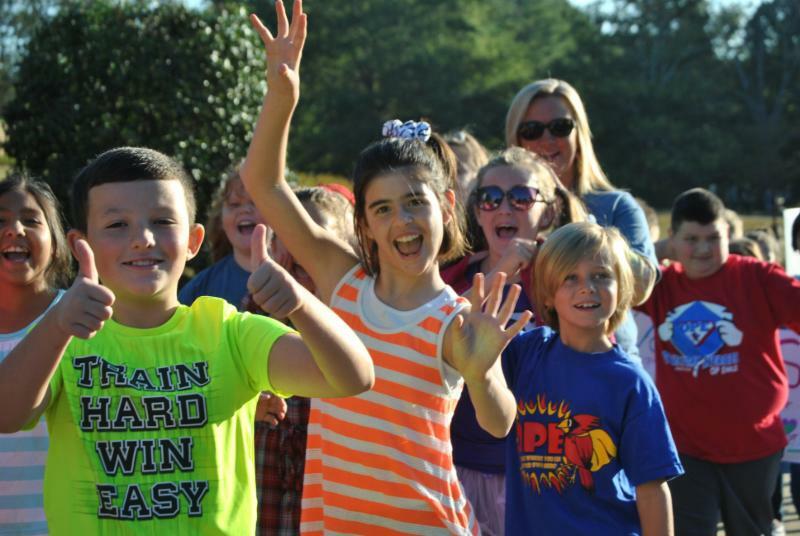 NPE is in its second year as an Arts in Basic Curriculum (ABC) School and is also a recipient of the Distinguished Arts Program grant funded by the South Carolina Department of Education. Through these grants, students at NPE will have expanded opportunities within the arts discipline that they would not ordinarily receive in the standard Arts curriculum. Dr. Garner was honored as the 2016 recipient of the Ray Doughty Arts Integration Award for his vision and sustained commitment to arts integration in South Carolina public schools. Under his leadership, three of District One’s ten schools have been designated as Arts in Basic Curriculum (ABC) and Distinguished Arts Program (DAP) sites. District One has added multiple arts specialists in the areas of music, band, theatre, orchestra, visual arts and GT arts. This year, the district added dance to its elementary school arts schedule through the hiring of a full-time, certified dance teacher. Student artwork is recognized throughout the district in Principal Art Galleries to showcase visual artwork at every school site, including Swofford Career Center. 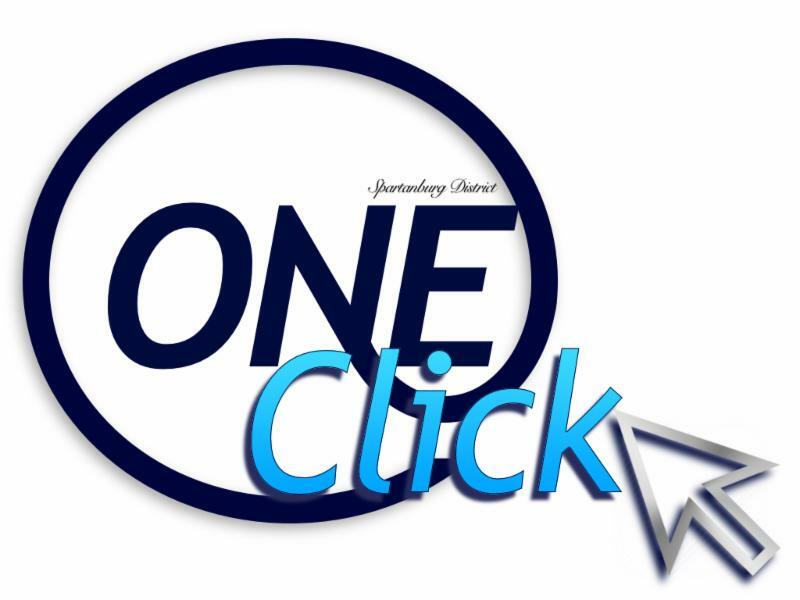 Both District One high schools have developed rigorous Honors Performing Arts courses in chorus, orchestra, and band. The district regularly hosts the Spartanburg County Middle School Chorus and Orchestra Festivals. 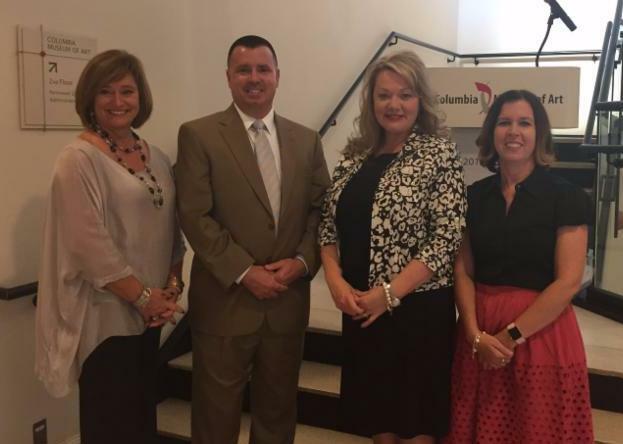 In addition, new performance venues have been created at Inman Intermediate School, New Prospect Elementary and Holly Springs-Motlow Elementary School. An arts integration segment has also been added to the monthly School Board of Trustees meetings. 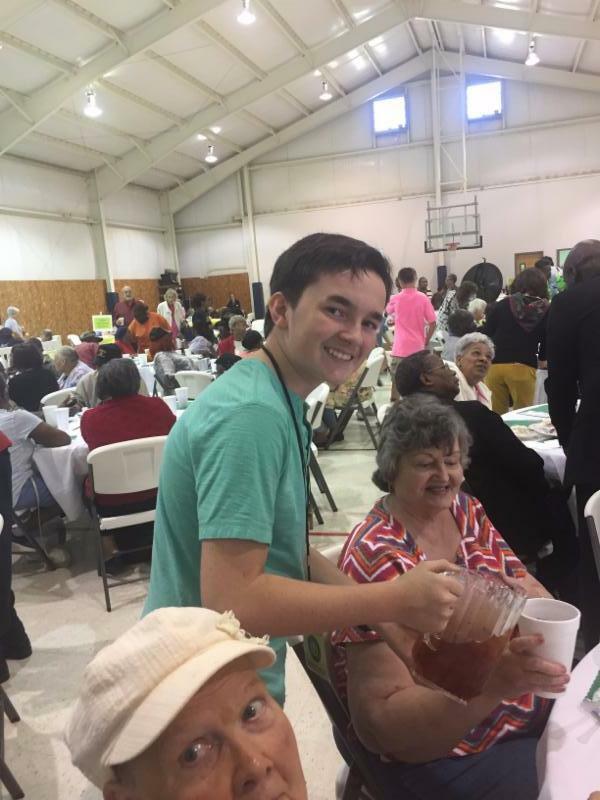 District One places a high priority on serving our community, and one of our largest community service projects is the annual Community Senior Day at Gramling United Methodist Church. 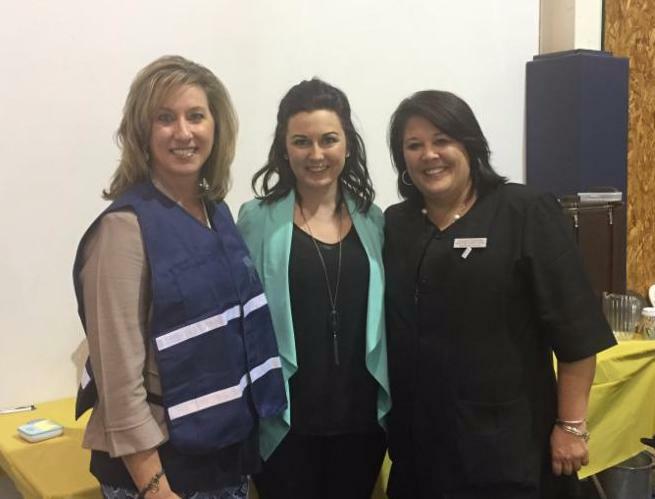 Community Senior Day is a day where multiple agencies in the area partner together to provide the senior citizens of Upstate, SC with services and resources in a fun and inviting atmosphere that they can look forward to all year long. 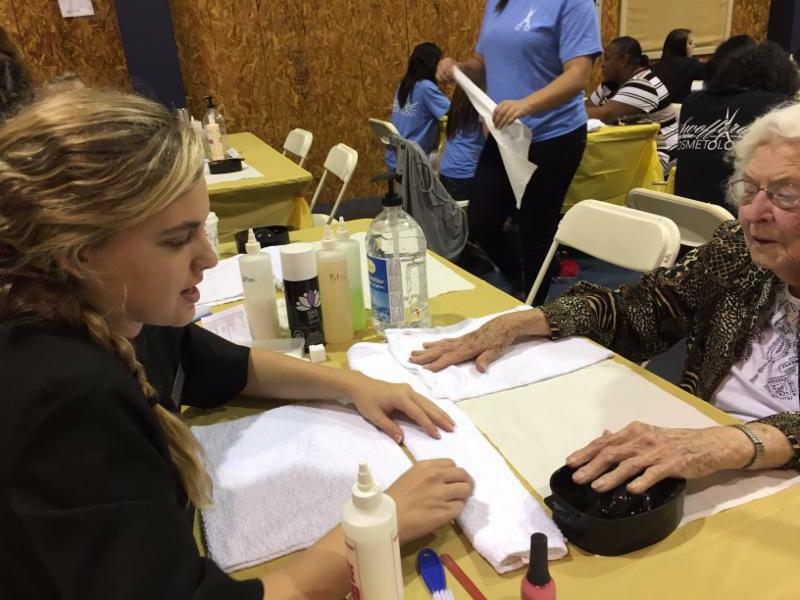 Seniors received assistance with everything from applying for benefits, to getting pampered with a free manicure from our students at Swofford Career Center. This day truly is the perfect example of what community is all about, and it gives our students and staff the opportunity to give back and build positive relationships. Students celebrated International Walk To School Day last month. This day encourages students to incorporate regular physical activity into their daily routines and promotes healthy life habits. Research suggests that physically active kids are more likely to become healthy, physically active adults, underscoring the importance of developing the habit of regular physical activity early. 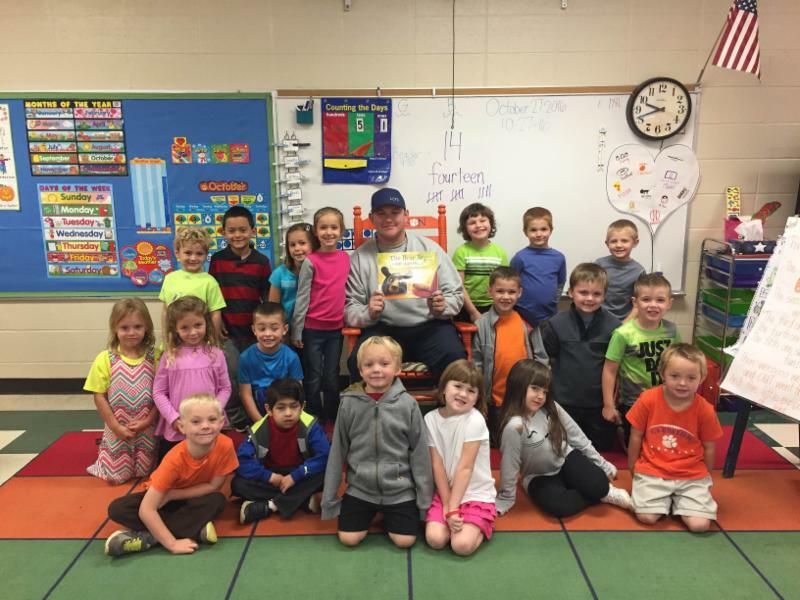 On October 27, 2016, guest readers from around the community were invited to O.P. Earle Elementary to learn, laugh, and read this year's Read for the Record campaign book, The Bear Ate Your Sandwich, as part of the world’s largest shared reading experience. The Read for the Record campaign is designed to inspire adults to read with children and put books in the hands of more children across the country. 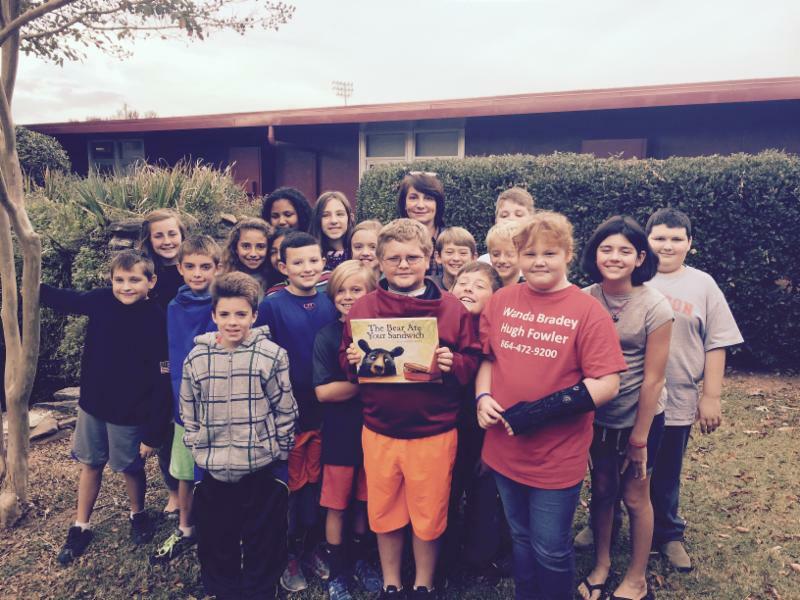 These students were very excited to be a part of the world's largest shared reading experience and are hoping to break the world record for the most people reading the same book on the same day. Last Friday, October 28th, students in District One celebrated "D1 Digital Citizenship Day" i n an effort to promote positive and responsible digital citizenship. 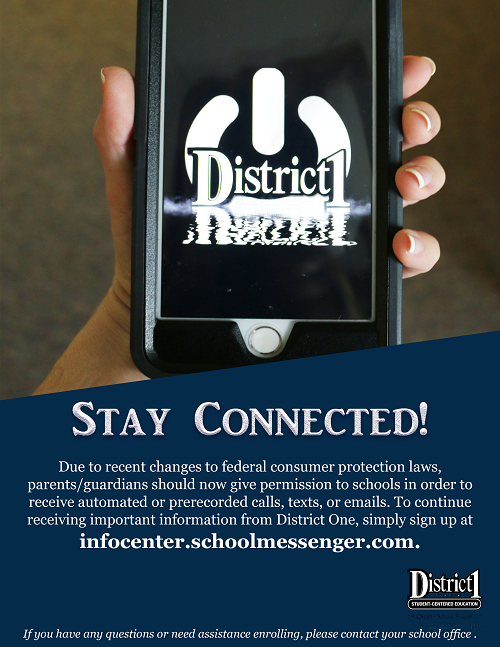 Districtwide contests were held at the elementary, middle, and high school levels throughout the week to encourage students to bring awareness to digital citizenship and the importance of internet safety. 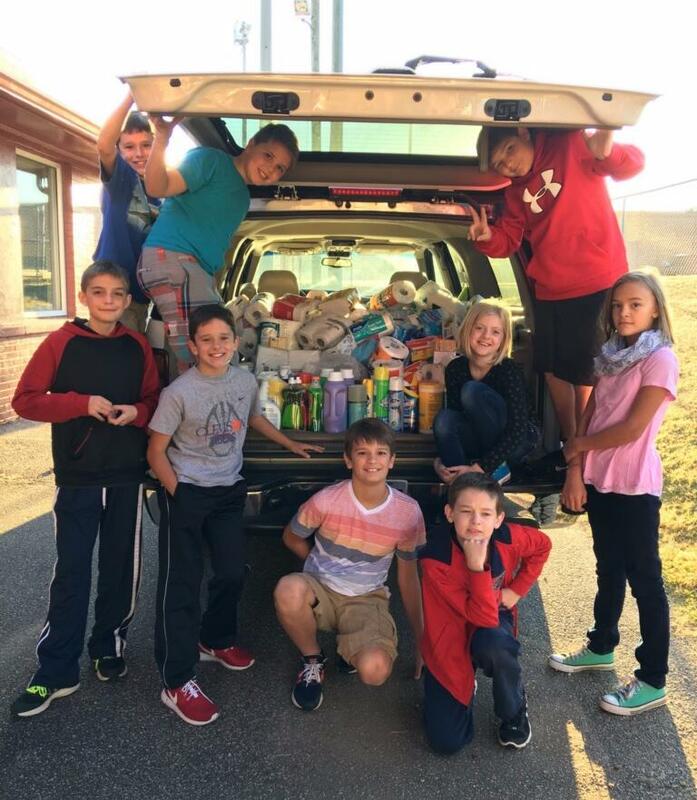 The winning rap video submitted by Holly Springs-Motlow Elementary School is attached in the link below. The rap was written by HSM music teacher, Dr. Meisha Adderley, and performed by the HSM Honors Chorus. 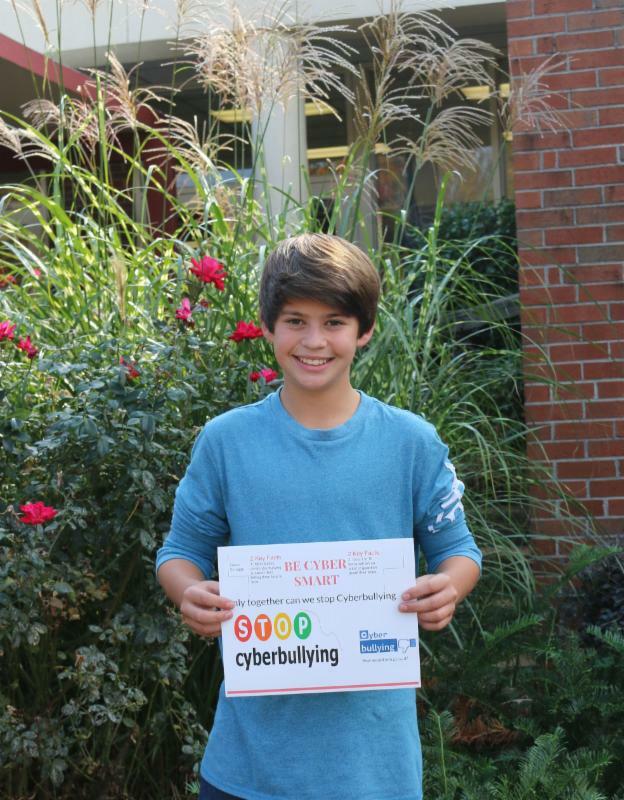 Landrum Middle School student, Owen Scruggs, was the winner of the middle school level contest. 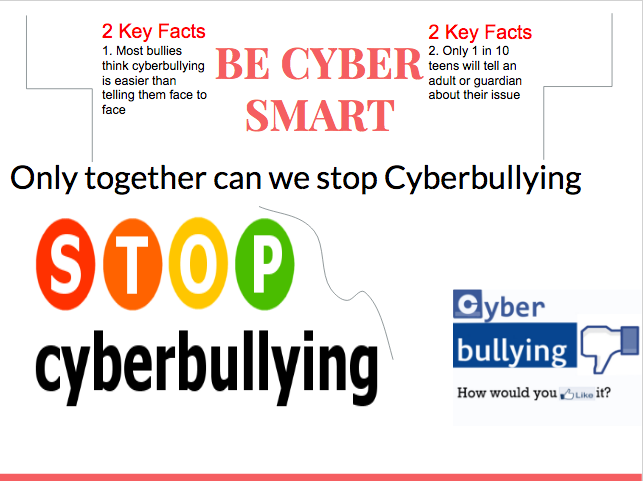 Owen created an infographic about an Internet Safety topic to help educate our community about online risks, and to engage students in discussions about appropriate online behavior. 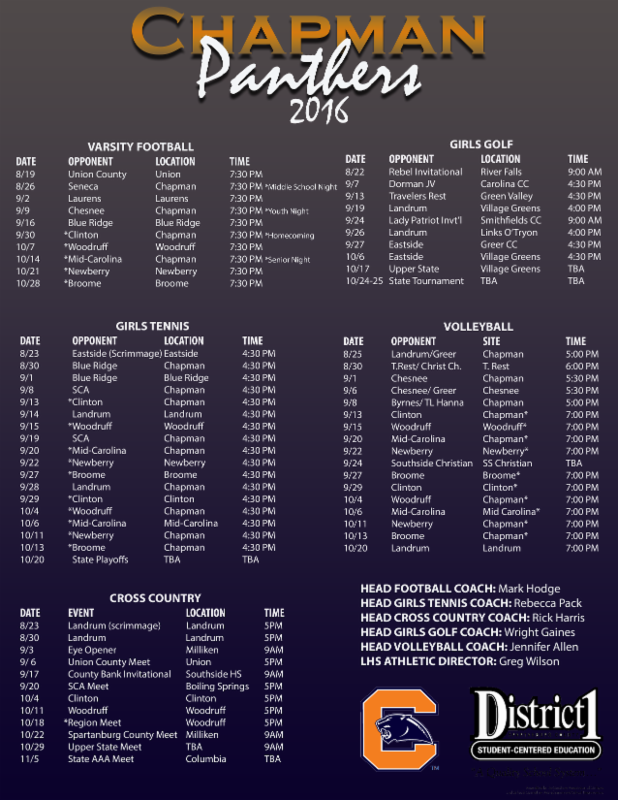 Owen's infographic will be distributed among all of the schools in the district and in businesses around the community. Way to go, Owen! 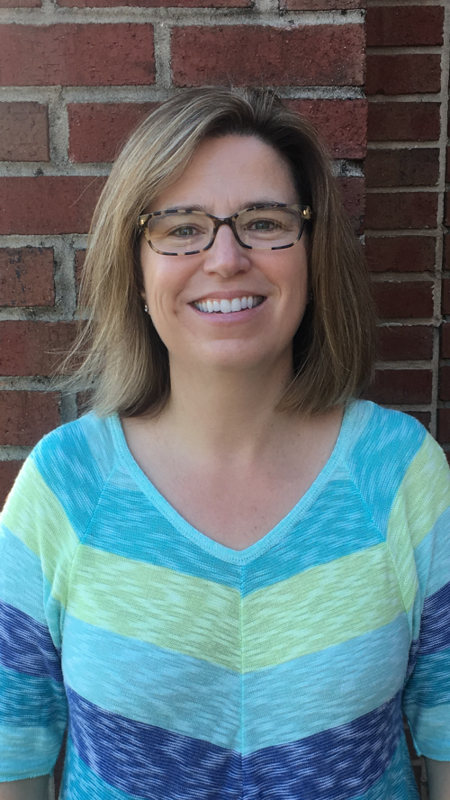 Congratulations to Cindy Lord, 2nd grade teacher at Holly Springs - Motlow Elementary, for being named the recipient of the Ann Z. Green Scholarship! In honor of Mrs. Ann Z. Greene, District One offered a full scholarship for a teacher to attend the Southeastern Reading Recovery and Early Literacy (SERRRA) conference at Myrtle Beach on January 11th-13th. This scholarship will cover conference registration, hotel room, and a daily meal allowance. 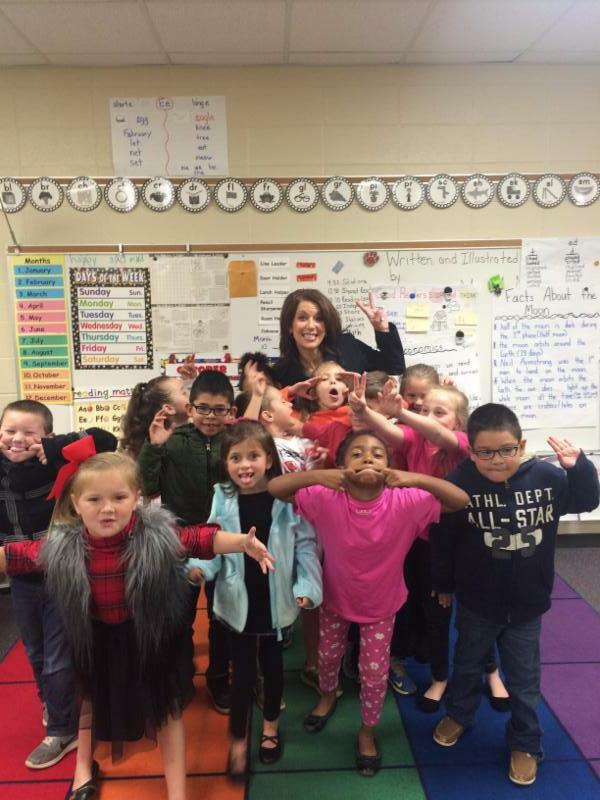 "Mrs. Lord is a model teacher, with a true growth mindset. 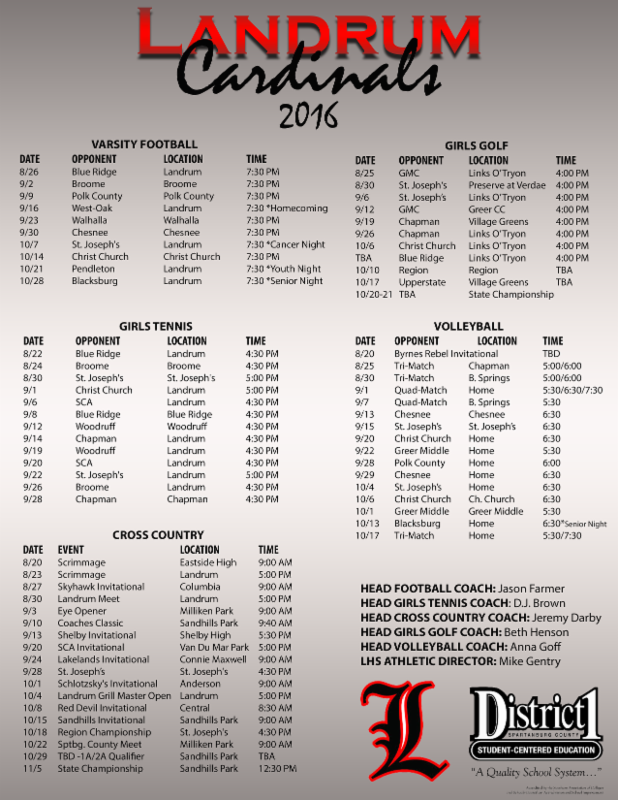 She is very deserving of this opportunity," said HSM principal, Erika Center. Brett Morley, fifth grade teacher at NPE, qualified for the USA Track & Field (USATF) 10 Mile National Championships in Minneapolis. Morley ran a very fast time covering the 10 mile distance in 51:03. He was 31st out of approximately 60 professional men and 30,000 other runners. Morley states, "It was a great experience because I was able to race against people I've only seen on television or the Olympics. I've been training hard and my times have gotten a lot better recently." 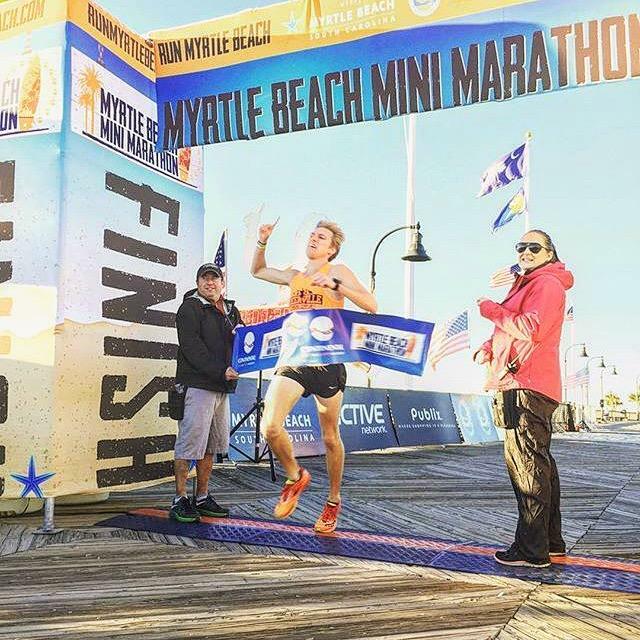 Morley recently raced in the Myrtle Beach Mini Marathon and finished 1st with a new course record and personal best time of 1:07:29. That time qualified him for the USATF Half Marathon National Championships in April 2017. Morley stated, "I was so ecstatic and happy. My coach and I have decided to pursue the Olympic trials for 2020 in the marathon. 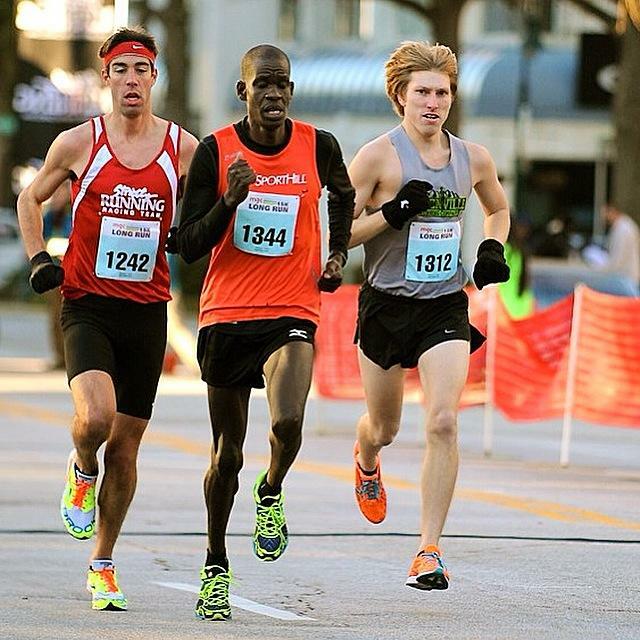 I am only a minute and a half off of the Olympic Trials standard." We look forward to seeing what the future holds for this incredible D1 teacher-athlete! 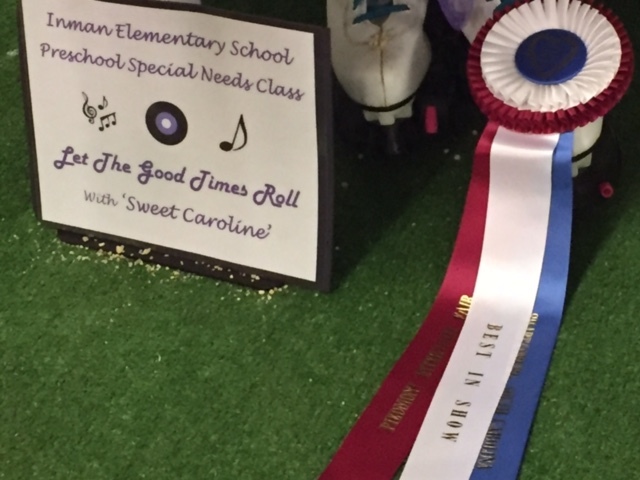 Congratulations to Ms. Paulette's class from Inman Elementary School for receiving BEST IN SHOW for their creation of ‘Sweet Caroline’ at the Piedmont Interstate Fair's scarecrow contest! This year’s fair theme was "Let the Good Times Roll." 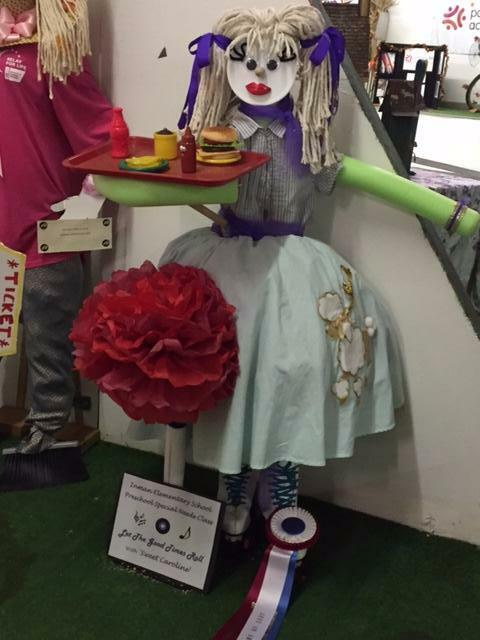 The contest required entries to be constructed of recyclable material to promote the importance of recycling. 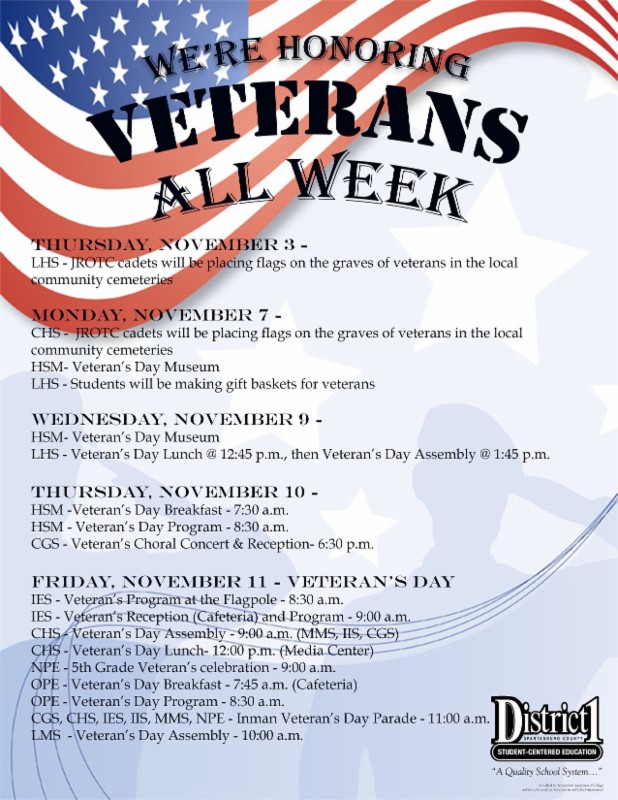 All week long, s tudents in District One will be honoring the brave men and women who have selflessly served our country and risked their lives to protect our freedoms.